The Just A Card campaign is one very close to our Crafty Fox hearts, as I'm sure it is to all designer-makers and independents who can relate to the concept that every sale counts, no matter how small. 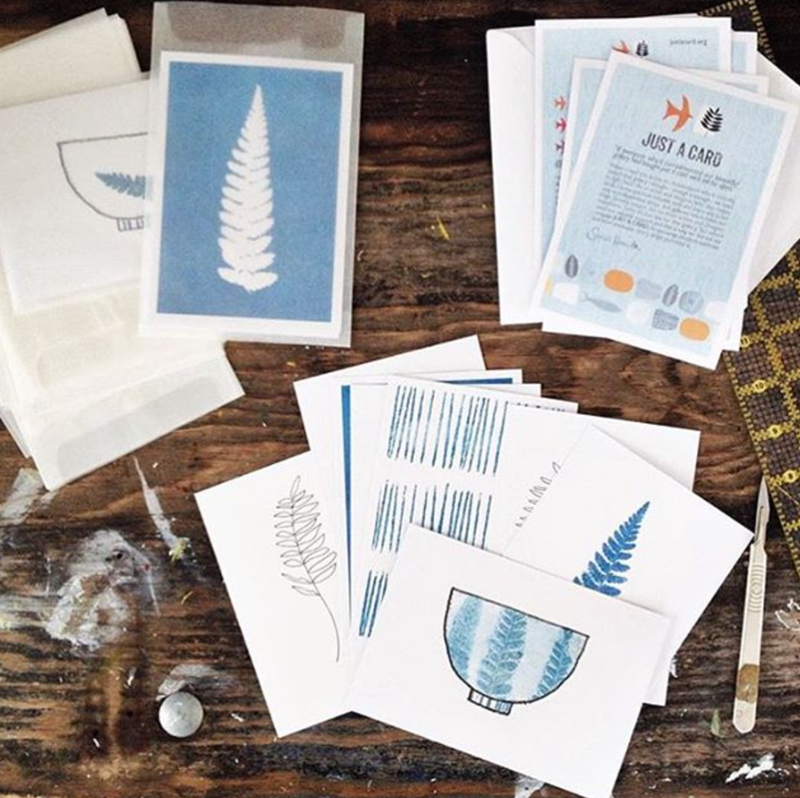 We catch up with Sarah Hamilton, artist, designer and founder of Just A Card to see how it has all been going and hear how the creative community has embraced the campaign. 'JUST A CARD' is a campaign to encourage people to support Artists, Designer/Makers & Independent shops. Our aim is to spread the message that every sale however small, even 'just a card', is valuable to creative people & businesses. They generate confidence and also much needed funds. Having been an Artist and Designer for many years I’d become increasingly aware how hard it is for Designer/Makers who’ve recently left college, or those making a career change, to establish themselves. Also Artists, Designers, independent shops and galleries are seeing overheads rise and sales fall. This puts a strain both on their businesses and on their day to day lives. This is unbelievably sad, and results in our high streets being overtaken by corporate chains and creative people not having outlets for their work. It's also a situation which could, with consideration, change. I’d been wondering for a while how to get the message across that sales, however small, make a huge difference to small businesses. When I read the quote, by gallery owners who’d recently closed "If everyone who’d complimented our beautiful gallery had bought 'just a card' we’d still be open" I had a light bulb moment. People often say they’re embarrassed to make a small purchase as it could appear mean. This is crazy. People wouldn’t feel that in big chain stores so the little guys lose out. Small sales add up! Compliments are absolutely wonderful, and hugely appreciated don't misunderstand me, but if people can manage even a small purchase it really can be make or break for that artist or gallery. Our aim is, by recognising our distinctive 'JUST A CARD' logo, people will be prompted to think of our simple message and remember what a difference their purchasing power can make. How have you found the public reaction? I imagine it has stuck with a lot of people and put them more in mind to buy a card, I know I always do now! Phenomenal, to be honest - we've had fantastic support from bloggers, press, shops, makers and the wider public. So many people say our message resonates with them. Many shops have posters up, Designer/Makers have our buttons on their sites too. The buying public too are extremely responsive to the campaign which is, of course, the point. However we are not complacent - to make a really big impact we need to build on this. Have you found that makers are now reaping the benefits of the campaign, are they finding more small one off sales at the markets and fairs? Absolutely! People are becoming increasingly aware of our campaign and Artists/Designers/Shops regularly report that their customers have said they've bought from them at design fares etc because they've been reminded how valuable and appreciated their support is. We find those people who chat to their customers about the campaign message certainly see returns in a number of ways, it's not only sales but engaging in conversation often leads to stronger relationships. Do you think the resurgence in snail mail and penpals has been good for the campaign? The general appreciation for provenance, quality and originality is certainly something which helps creatives. Many people realise that something handmade with love is both precious and valuable. We at 'JUST A CARD' love 'Thinking of You Week' an initiative run by Sharon Little at The Greeting Card Association. Sharon encourages people to send handwritten cards from 26 Sept to 2 Oct. How fantastic - receive a handwritten gesture of friendship rather than some junk mail or an overdue bill reminder! We hope lots of people making cards will get involved. There's lots to it so check out it out here. Tell us more about your art, what’s been going on in your studio lately? It's been an extremely busy few months - I've been working on a range of diverse projects. I recently been commissioned to create some large format artworks and I'm planning to produce more 'one off' artworks. Cards are still very close to my heart - I don't make them in the vast quantities I used to when I sold to major retailers, though I still make & sell hundreds each year. They're an important part of my creative process. Who are your favourite makers to watch out for this year? Goodness I couldn't possibly narrow it down - there's so much talent out there. We profile Artists/Makers on our blog, written by Kate Marsden, every week so I'd say take a look - you'll be inspired! What are the future plans for Just A Card? I've now been joined by a fabulous team of volunteers, who you can meet on our website. As you can imagine the campaign is very time consuming so every inch of support is fantastic. With everyone's help the aim is to build our Social Media presence, share the message far & wide so more makers & shops can benefit. We'd urge anyone reading this to get involved. The campaign isn't only about Social Media - loads of people use good old fashioned chitchat to spread word too! The campaign is for and about everyone who's passionate about creativity and originality. We don't have funding so our biggest asset is the amazing community of Artists/makers out there who help everyday. It's important to remember that by sharing awareness people are not only helping themselves they're also supporting their friends, neighbours and fellow creatives. So get involved - collectively we can make a huge difference! Market Diaries - Ding Ding pt 2.